In MISSLCOM64, you control the missile defence system for a small town that's under attack. Move the cursor with the arrows and send bullets up to destroy the missiles with Z. 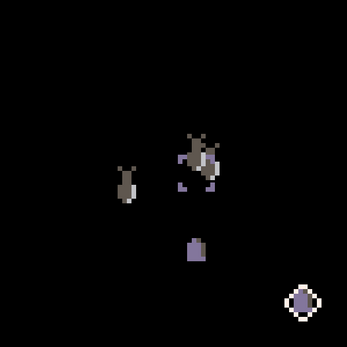 Made in 2-3 hours for LOWREZJAM. Hinged on the realisation late the night before submission that I could hack my own sprite function to make PICO-8 effectively 64x64 (by stretching EVERY sprite*2). Unfortunately this meant to stay within the 64x64 grid, I had to do a lot of manual drawing of text and write a custom function to draw numbers based on sprites too. Still, I think it came out pretty well. If I'd come up with a way to do text without drawing it in the spritesheet, I would have had an easier time I think. (And given how quickly I did the numbers rendering function, it would have been well worth the time invested.) But it would've meant either custom sprite sizes for text, or having a lot less text onscreen. So whatever. I'm pretty sure it conforms to the 64x64 grid at all times, since I don't do any drawing without the SPR64 function below, and that function should snap to the grid. If you replace all your SPR() calls with that, and keep your coordinates inside (64, 64), it should 'just work'. EDIT: You can also just do POKE(0x5F2C,3) to achieve the same effect without all the messing about. >.< Oh well. It was a fun hack. PICO-8 game in PNG form. Requires PICO-8 to play if downloading the PNG. Otherwise, playable in-browser.